Nokia’s latest Smartphone Nokia Lumia 900 Windows Phone users have some experiences with the software problem issue. After reporting such problems, AT&T recent releases an update for a Lumia 900 operating system. This update is now available for both Windows and Mac OS users to update it from their PCs. Last week, AT&T found out some connectivity issue reporting from customers that they have such issues with their handset. Though this happens to minor users, but Nokia quickly releases an update to fix its connectivity problem. 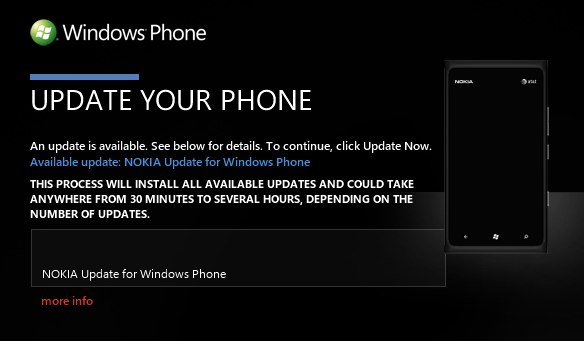 Unfortunately, Nokia Lumia 900 Windows phone won’t update automatically. So you have to fix your connectivity problem manually. To do this, you have two methods. For the first method, you have to download Zune software and install it on your computer. Then connect Nokia Lumia 900 through data cable on your PC and Zune starts to update and fix the connectivity issue with a pop-up window. For 2nd method, you have to go to the local AT&T store and they exchange it with a brand new one. This offer will be valid till April 21, 2012. From April 8th, 2012, Nokia launch their latest Smartphone Nokia Lumia 900 Free if you buy it from AT&T with connection. This offer also valid till April 21, 2012.